For automatic sign in you have to specify Url for login (web address which points to login page). If web site offers Url with HTTP and HTTPS at the beginning, choose HTTPS - secure (encrypted) hypertext transfer protocol. Go to Home Page of the provider - check if home page has Username (or Email, Id or whatever they call it) and Password. If it does verify that cursor is in the Username text box. If it is, you can use home page as login Url. Home Page with Username and Password - focus not on Username - press TAB and verify if the focus is on Username. If it is, you can use home page as login Url. Home Page with Username and Password - unable to place focus on Username - click Login button without entering username and password. This usually causes web site to navigate to login page. Verify if cursor is on Username. If it is, you can use Url in the address bar as login Url for Guarded Key. If focus is not on Username, press TAB. Verify if cursor is on Username. If it is, you can use Url in the address bar as login Url for Guarded Key. Home Page without Username and Password - find "Login" or "Sign In" button and click on it. This usually causes web site to navigate to login page. Verify if cursor is on Username. If it is, you can use Url in the address bar as login Url for Guarded Key. If focus is not on Username, press TAB. Verify if cursor is on Username. If it is, you can use Url in the address bar as login Url for Guarded Key. Increase browser delay to 10 seconds (or more). 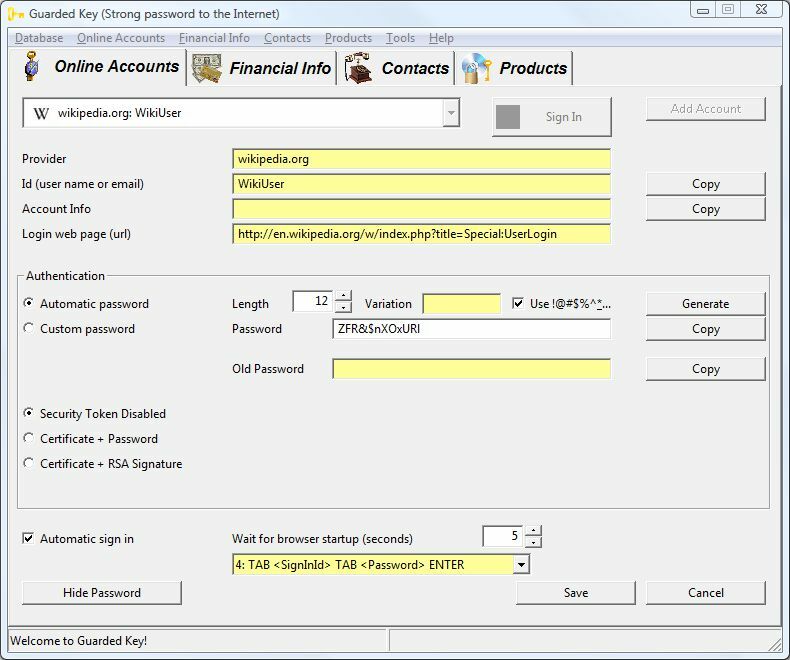 Click on an account in Guarded Key, it will start browser and navigate to the login Url. When the page is loaded quickly click on Username text box and let Guarded Key do the rest. It will automatically enter Username, press TAB, enter Password and press ENTER key to sign in.